I've found a new friend, hard cider in the can, courtesy of Jack's Hard Cider located in the Adams County - apple country - just west of Gettysburg. Jack's is the companion to Hauser Estate Winery and the apples are harvested directly from the property, fermented at the winery, and then canned for easy transportation. The brand is named for the patriarchs of the Hauser family, Jack and Helen Hauser. Jack was the driving force behind Musselmans - where we still purchase their 100% freshly pressed apple juice - not concentrated - and apple sauce. Back to Jack's, they produce two styles of hard cider - the dry Original (green) and the sweeter Helen's Blend (red). Both are produced from a medley of the almost twenty apple varieties grown on the property. Both provide a mouthful of baked apple flavors, approximately three apples per can, with a refreshing acidic finish. The only difference is the sweetness, choose which you prefer. Cheers to hard cider. This weekend my brother-in-law expressed a new interest in whiskey - without his normal tendency to mix anything with cola. Thus I subjected him to a lecture on the various types of whiskey (i.e what is bourbon, Tennessee sour mash, Scotch, moonshine....). 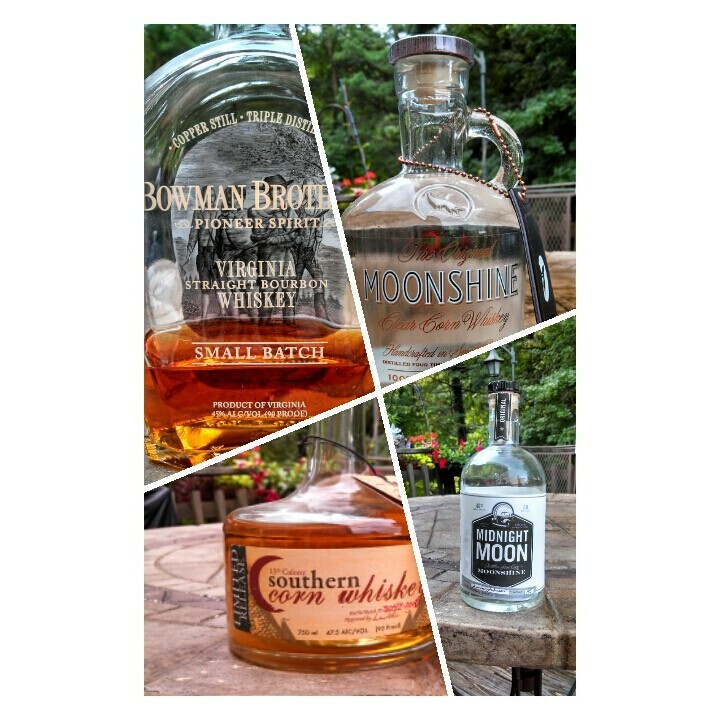 We then sampled a few styles from Virginia, North Carolina, and Georgia that I had open on the bar: two moonshine styled whiskeys and two bourbon styled whiskeys. 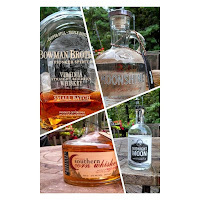 The Bowman Brothers Pioneer Spirit was a clear favorite, followed by the Junior Johnson's Midnight Moon. Tasting notes are below. Cheers. 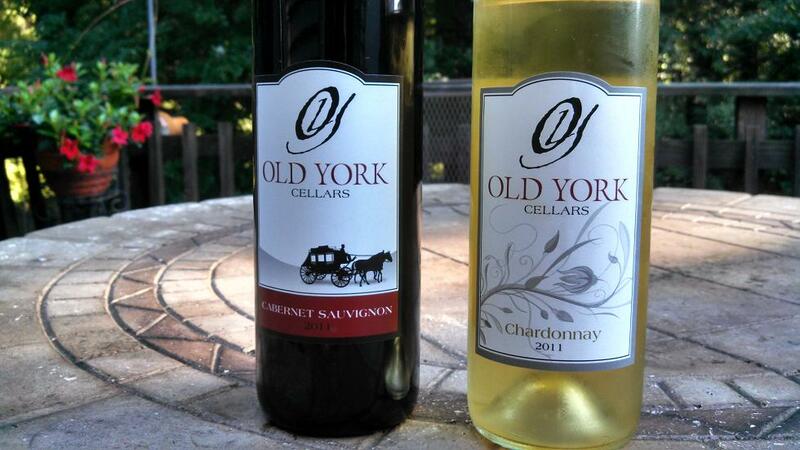 Last night Old York Cellars hosted their second Virtual Wines online tasting where consumers can watch and/or participate in a tasting of two wines from one New Jersey's oldest wineries - active since 1978. The winery encourages consumers to participate at the winery, by hosting their own tasting party, or follow along via the Virtual Wines Livestream site, Facebook, or Twitter. For me, I was fortunate to receive a complimentary sample. On June 20th, I participated in Old York Cellars' in inaugural online tasting focusing on their new What Exit Wines brand - where consumers can actually customize the label of every purchased bottle. Pretty cool. Last night's tasting was hosted by winemaker Scott Gares and featured two vinifera wines: the 2011 Chardonnay ($17) and Cabernet Sauvignon ($21). We started with the 2011 Old York Cellars Chardonnay and during the webcast, winemaker Scott Gares described the vineyard and winemaking practices for this wine. Because of New Jersey's hot and humid summers, they pull leaves off the vines in order to help the grapes dry from the moist humidity. The grapes are then fermented in stainless steel, undergo a secondary malolatic fermentation and then ed four months in medium oak. The result is a wine that balances between the "naked" and buttery spectrum. The nose and initial flavors are a creamy pear-apricot whereas it finishes with green apple and nice acidity. This is a decent wine, low in alcohol (12.2%) and right in the drink local priceline. The winery also recommends several pairings - basically anything with creamy butter - but also includes crab - old bay; risotto; Gruyere or creamier cheeses; Caesar salad; pork loin; apple, pecan, or key lime pie; and pound cake with strawberries. The final touch is that the sample pack we received included chocolates from Laurie's Chocolates - and the I really liked the pairing with the milk chocolate caramel. Moving to the 2011 Cabernet Sauvignon, this wine spent 16 days on skin and after fermentation, aged 6 months in medium oak. The result is a fruit forward, medium bodied wine with ripe cherry flavors. The finish is easy, with soft tannins. This is not your California cab or even a Bordeaux, but a very tasty option. As for food pairings, the winery suggests burgers, beef stew, pizza, Italian seasoning, short ribs, dark chocolate, aged cheddar, or colby. As for Laurie's Chocolates, the Cabernet truffle was spot on - a truffle made from the very wine. I look forward to visiting Old York Cellars. You got to respect a winery that takes the time to create a virtual tasting. Plus they host live music. Recently I had dinner had my favorite Vienna restaurant, Alegria, and for the first time, skipped the tequila and sampled some Mezcal. This spirit is the original Mexican spirit, first distilled by the conquistadors after they ran out of rum. They noticed that the indigenous population drinking pulque, a fermented beverage from the maguey agave plant. Distillation soon commenced and today it is distilled throughout Mexico - although its epicenter is Oaxaca. In the past, I had avoided mezcal primarily because I had only tasted lower end versions (with the worm) which didn't compare favorably to Mezcal's tequila offspring. No longer - particularly after a round of Del Maguey (ma–gay) Minero Single Village Santa Catarina Minas Mezcal ($70). This is as tasty as any fine 100% blue agave Tequila, with a mango nose and flavor followed by an enticing shot of motor oil - think rich and smooth. This mezcal is completely organic, not because they strive to reach that certification, but because that's how they've been producing the spirit for centuries. This particularly brand comes from the village of Santa Catarina Minas and palenqueros, Florencio Carlos Sarmiento and his sons Florencio Carlos Vasquez and Luis Carlos Vasquez. They pound the roasted agave by hand and then distill the fermented pulp in a clay still with bamboo tubing rather than a copper still and tubing. Now that's cool. And major kudos to Del Maguey for singling out individual family palenqueros in small villages in every mezcal in their collection. I'll keep looking for the green bottle. Thanks to original founder Lenn (@lennthompson) and Tim (@WineCast) for resurrecting Wine Blogging Wednesday, starting today, with dry rosé wines. 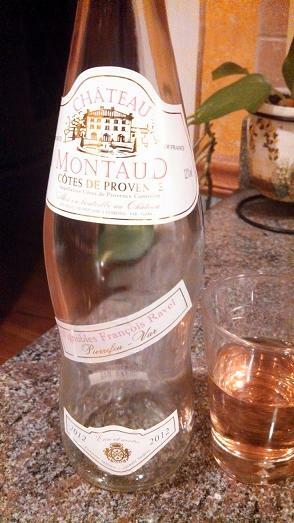 I hightailed it to our local Whole Foods and found a value Cotes de Provence - the Château Montaud - 2012 Vignobles Ravel ($12). I believed I sampled an earlier vintage at a Wines of Provence tasting, but this #wbw80 allowed me to concentrate on just this wine. The rosé is a blend of two of the major Provence players (Cinsault & Grenache) as well as a touch of Syrah and Tiboure.The grapes macerate on their skins for some color and flavor, then the grapes are gently pressed. This flavor is more cherry than strawberry, a slight peppery and silky mid, and a nice acidic finish. And we finished the bottle in less than 30 minutes - very drinkable and a bargain. Cheers to rosé, Provence, and #wbw80. Starting with the Domaine Skouras, the Moschofilero is a white wine grape with a purple skin - making this a vin gris wine. It is grown throughout Greece, but has found a noticeable home in the Peloponnese. It has an inherent spicy character which reminded me of a Rkatsitel, with the floral aroma of a muscat. Although many others thought the aroma seemed very Viognier-ish. The finish was tart and acidic - very refreshing and pleasant. 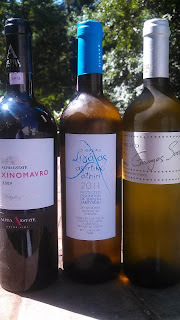 I've become very fond of Assyrtiko wines from Santorini and one popular style is to blend this grape with Athiri. The latter adds some weight and depth along with more fruit flavors to the mineral-salty rich Assyrtik. The Domaine Sigalasis a fantastic wine; the finish goes on forever. The flavor profile starts with yellow fruit and ends with great acidity and mineral balance. Give me some oysters. The final wine was the Alpha Estate Xinomavro, harvested from the Amyndeon AOC northeastern Greece. In this region, winters are wet with moderate temperatures; summers, hot and dry. The result is intense fruit which produce intense wines, and that describes the 2009 Alpha Estate Xinomavro. It was much bigger than I had imagined, full of purple fruit flavor - very plummy - plus a black pepper spice. The finish was acidic and tannic - no wonder Alpha Estate ages this wine one year in the bottle before release. Regardless, the wine benefits from an aerator - maybe even a blender. It screams for rich red meat. Not surprisingly, the following day the wine had mellowed - still plenty of plum flavor, but the tannins had dissipated to leave a smoother - easier to drink wine. Go out and explore Greek wines. They area affordable, very drinkable, low in alcohol, and becoming more accessible - what more incentive do you need.